Wednesday is a big day in the foreign exchange market, particularly for the U.S. and Canadian dollars. The price action of these currencies tell us that investors are worried that Federal Reserve Chair Janet Yellen and Bank of Canada Governor Poloz will disappoint. The U.S. dollar traded reversed its earlier gains to end the day lower against the Japanese Yen. It is also down sharply against the euro and is only up against sterling because of the market’s lack of confidence in the BoE. 10-year yields have fallsn frozen since Friday and the lack of positive momentum confirms that investors fear Yellen may not be hawkish enough. Part of these concerns stem from the unevenness of U.S. data but Yellen has very little reason to shift her tone with job growth rising and manufacturing and service sector accelerating. Most U.S. policymakers believe that wages and spending will pick up as the labor market continues to improve. This includes Fed President Williams who said today that the forecasts for 1 more rate hike this year seems reasonable. So while investors fear that Yellen will disappoint, we don’t think she will as the latest jobs report is strong enough for her to highlight the improvements in the economy and stress the need for policy accommodation before Congress over the next 2 days. Yellen’s testimony begins at 8:30 AM NY Time / 12:30 GMT / 10:30 PM AEST. Her prepared comments will be followed by Q&A. The dollar will rise if she emphasizes the need for continued gradual removal of policy accommodation and will crash hard if she is noncommittal about additional tightening. For USD/JPY that means 115 is the target on the upside for hawkish comments and 112.50 on the downside if she is wishy-washy. The Beige Book report is also scheduled for release but the impact on the dollar should be limited as investors take their cue from Yellen. USD/CAD’s move back above 1.2900 also suggests that the market is worried that the Bank of Canada won’t be hawkish enough. The BoC is widely expected to be the second G7 central bank to raise interest rates with market is pricing in a 90% chance of a 25bp hike. So while tightening itself could give the loonie a brief lift, the big question is the central bank’s guidance for what comes next. Although investors are only pricing in 29% chance in September, they see a 50% chance of a second hike by October. Interest rate futures and the 6% rise in the Canadian dollar over the past 2 months indicate that investors are positioned for hawkish forward guidance so if Poloz under delivers by saying that they are neutral after the hike USD/CAD will blow past 1.30 quickly. However if Poloz signals that the hike is the beginning of a new monetary policy direction, we could see USD/CAD drop as low as 1.26 in the coming weeks. 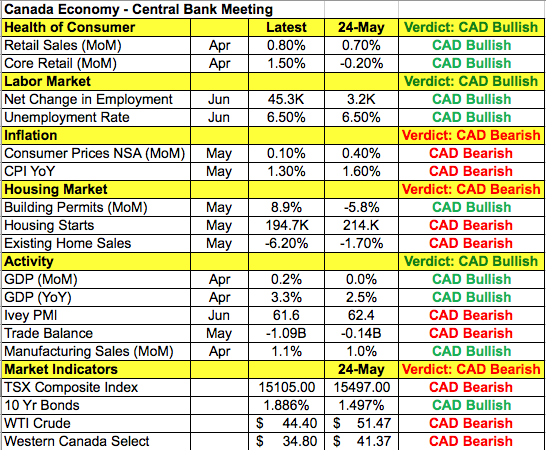 Taking a look at the table below, there have been both improvements and deterioration in Canada’s economy since the last meeting. The good news is that retail sales and employment is up strongly while GDP growth has averaged 3.5% over the past 3 quarters. Although the Canadian dollar is up 6% in the last 2 months, it is the second worst performer year to date. Yet, low inflation, weaker housing activity and the pressure on oil prices should worry the central bank and for this reason, unambiguous hawkishness is not a done deal tomorrow. Sterling crashed today after the market realized that Bank of England member Broadbent posed no threat to the short sterling trade. Haldane’s comments didn’t make it to the headlines and all Broadbent said was less trade after Brexit would lift prices and reduce employment in some sectors. Sterling nosedived as investors see very little risk of a near term rate hike from the Bank of England. GBP/USD is eyeing 1.27 but whether it gets down there or not hinges in large part on tomorrow’s UK employment report. While wage growth is expected to slow, both the services and manufacturing sectors saw strong job growth last month according to the PMIs. The service sector in particular reported the strongest increase in jobs since April 2016. Healthy numbers would give us the opportunity to sell GBP at higher levels whereas softer figures will take GBP/USD below the 20-day SMA at 1.2830 and down towards support near 1.27. Euro rose to its strongest level in more than a year as the dollar retreated and investors bought EUR/GBP. 1.15 is in sight and we would not be surprised if the currency pair tested this level before Yellen’s testimony on Friday. No Eurozone economic reports were released today so this was purely a function of anti-dollar flows. The email correspondence between Trump Jr. and a Kremlin-connected Russian lawyer makes investors nervous and they are turning to the euro, with its steady data improvements and hawkish central bank for safety. Tomorrow’s Eurozone industrial production reports are expected to lend further support to the currency after the strong rise in German and French IP. Meanwhile the Australian dollar traded sharply higher today while the New Zealand dollar dropped to its lowest level in 3 weeks. NZD was hit hard after an earthquake off the coast and by significantly weaker than expected card spending. AUD on the other hand benefitted from AUD/NZD flows and stronger than expected Australian business confidence.